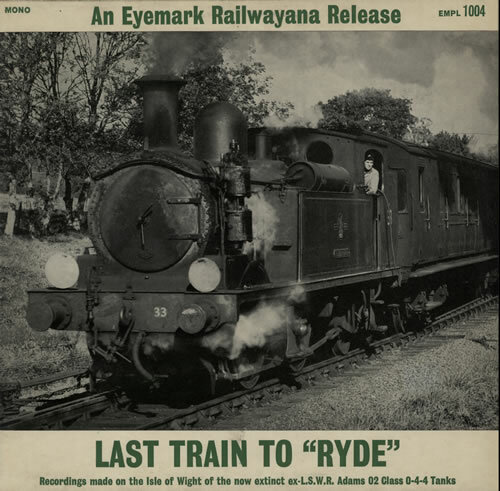 VARIOUS ISLE OF WIGHT TRAINS Last Train To Ryde (Rare 1967 UK 7-track mono LP featuring recordings of The Adams 02 Class 0-4-4 Locomotives in the Isle Of Wight, one of very few recordings released on the 'Eyemark' label, front laminated picture sleeve. The sleeve shows just a little light shelfwear with mild discolouration in places on the unlaminated back, while the vinyl remains in excellent condition with few signs of play EMPL1004). Non Stop Talyllyn - A Memory In Sound Of A Journey On The No.4 Engine, "Edward Thomas"
or visit our Various-Trains image gallery.